Sorry that we were a bit late getting to covering the news of the day involving the powerful, deadly storms that killed eight in Virginia and have left just short of a million people in the Commonwealth without power at this writing. My first priority upon waking up this Saturday morning wasn’t reporting the news – it was helping my sister manage after having made the news. 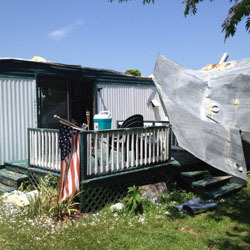 Her Crimora mobile home was condemned after winds from Friday’s storms ripped the roof from the top and peeled it back like a lid on a can of peaches. Luckily for us, no one was hurt – and the no one included my mom and stepfather, who were in town from their home in Maryland to attend my 40th birthday bash. They were at my sister’s home when the storms hit, and from what I’m told there was a moment or two when all inside thought they might be goners when the winds did their worst damage. We pitched in to help this morning, running out to Lowe’s to buy boxes and packing tape and helping recruit some volunteers to help my sister pack up what she could salvage from her home. Fortunately she and her fiancee have already found an apartment to rent and have gotten some help from family members to get settled. We’re going to still have to help with the expense of removing the mobile home. The scene at the home was actually a nice one, if you can imagine. About 20 family, friends and neighbors were there to help pack things up and load them on trucks to get them to their next destination. People came from as far away as Sherando, about a half-hour drive, to pitch in. I feel a little better about the world today having been a small part of it. My sister will be OK, I think, in the end. She took the hard reality that was dealt to her last night about as well as could be expected, honestly, better than I would have. Maybe it helps knowing that she has a lot of people around who love her and are there to help on a moment’s notice. She has that, and her life, which for a few moments last night was hanging in the balance.